I'm continuing my "Best of 2013 Rewind" with some Alaskan wildlife - specifically the marine animals that I spent almost two weeks photographing during a coastal Alaska trip in May 2013. Alaska has incredibly rich marine biology and it was a real treat to spend that much time watching whales, seals, eagles, goats, and birds. You really can't appreciate these animals through your television - the personal encounters in Alaska were really a once-in-a-lifetime experience. 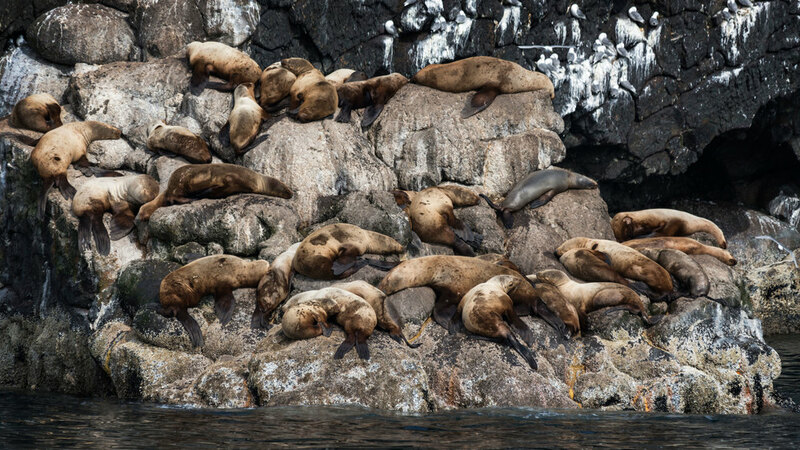 You could argue that this photo of a pile of stellar sea lions isn't my best wildlife shot, but it's certainly amongst my favorites. For starters, if I hadn't told you these were sea lions, you could tell just by how high they crawl up this rock - seals have short front fins, which means they can't climb nearly as well as their sea lion cousins. If this was a video, you could also tell the difference as these sea lions are noisy! These are wild stellar sea lions - to get this photo we chartered a boat to take us into Resurrection Bay outside Seward, Alaska. We had to be very quiet while we stalked the sea lions - any loud sounds could send them plunging into the water. We also had to be careful not to frighten them unnecessarily - a jump into the water to avoid a boat could unintentionally send them into the waiting mouths of their predators! The approach was long and slow, but we finally got into a position where we could really appreciate the beauty and size of these amazing animals. The trip through Alaska was a real treat and I'd highly recommend it to anyone else looking to immerse themselves in LOTS of wildlife! Certainly on my 2013 highlight reel!